Canada is a country that produces some really superb examples of wonderful marquetry. The tea caddy seen here (which is a good example of the superb marquetry Canada produces) has all 8 sides decorated with marquetry - 4 of which are of floral designs. 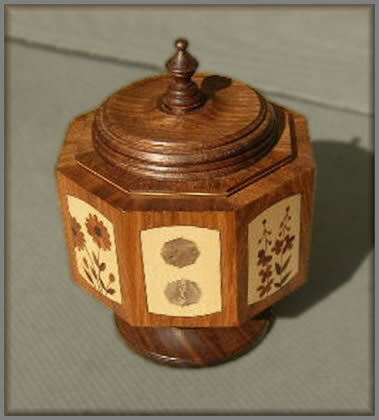 The turned base and lid of walnut were turned and finished on our Canadian contributor's lathe. This tea caddy was previously submitted to the Calgary Stampede & Exhibition - Arts & Carfts section and was awarded a blue ribbon.